What an exciting All-Star game last night and (Home Run Derby the night before). We weren't able to catch the entire game but we did see the highlights this morning. From what I understand the longest All-Star game ever. 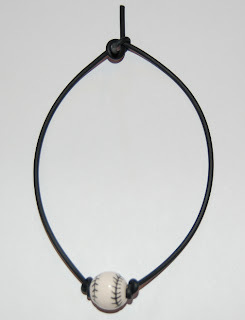 In honor of the game and baseball in general we wanted to highlight a Baseball Sports Bracelet and Baseball Sports Necklace - these beaded baseball products are made with a ceramic baseball bead strung on a Neoprene (Rubber) band. The bracelet band measures 12" so it will fit all wrist sizes when knotted and is comfortable to wear; it currently is priced at $10.00. The necklace band measures 24" and currently sells for $15.00. These items are sure to be a "hit" for your little slugger! !